Sbangle Sbangle Wear Art, Thou! Christmas and shopping seem to be synonymous these days. The frantic search of holiday shoppers for the right gifts can sometimes be filled with frustration that later is forgotten by the satisfaction of presenting the gift to a joyful recipient. As consumers we may not think of a business as experiencing satisfaction after going through a similar process of creating the right product and providing it to their customers. But one small business in The Bronx is making a big impact with their products, wearable art. Sbangle is a Bronx based small business launched in October 2012 by founder and CEO Vicki McGuigan, a proud Woodlawn resident, with the support of her husband and family. At Sbangle they create handcrafted jewelry with the beliefs that, art is not only to be displayed at museums as we ourselves are works of art and that beautiful accessories are for everyday use, because each day is a special occasion to be celebrated. 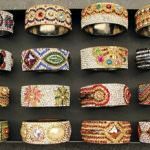 Their dazzling pieces of wearable art (particularly the Sbangle bracelets) captivate fashionistas and art lovers alike while simultaneouslysupporting causes that impact people’s lives. On January 2013 Vicki launched Sbangle for Charity contributing 10% of the sales to reputable organizations as carefully selected as each hand laid stone of your Sbangle bracelet. “We wanted to find local, national, and international charities whose priorities are research as well as putting the maximum amount of funds raised into the fingertips of those who are impacted by serious diseases and conditions” said Vicki when asked how charities were selected. Today Sbangle has been able to increase their donations to 20% and supports six charities, each having a personal significance to the founder. Teal & Diamond– The Corinne Feller Memorial Fund was added after Vicki attended a fundraiser and was moved by Nicole Feller’ Lee’s dedication to honoring the legacy of her sister who succumbed to ovarian cancer at the age of 18. Pink & Diamond– The Breast Cancer Research Foundation was selected because both Vicki’s grandmother-in-law and mother-in-law are both survivors of breast cancer. Gold & Diamond– The Ty Louis Campbell Foundation (pediatric cancer) was added after Vicki’s cousin introduced her to Cindy Campbell who had started The Ty Louis Campbell Foundation to honor the legacy of their brave warrior, Super Ty Louis Campbell, who succumbed to his two year long battle with a rhabdoid tumor, a rare and aggressive type of cancer specific to pediatrics. Purple & Diamond– March of Dimes is in honor of Vicki’s sister and her twin daughters whom she lost to their premature birth when she was three and a half months pregnant. Ruby & Diamond– The American Foundation for AIDS Research was selected because of the perseverance a friend who has been living with HIV for more than a decade. Orange & Diamond– Kidney Cancer Association was most recently added for their efforts to raise awareness of renal health, research, and support for those affected by renal cancer are tireless. Sbangle creates piece of artisitic jewelry as unique and purposely crafted as each individual while providing support to causes that affect many of our lives. When you give Sbangle you’re not just giving a gift you are also giving real hope to a family or individual impacted by one of these causes. The Bronx is not only booming because businesses are growing but because even small businesses like Sbangle using their entrepreneurial skills to bring about positive change. As Sbangle for Charity gets ready to celebrate its one year anniversary in January 2014, they are looking expand their efforts to use wearable art to raise awareness of and funds for additional worthy causes. In addition to Sbangle for Charity, Sbangle has the custom collection, the slim collection and housewares, they are also in the process of adding different styles and products so stay tuned because, unlike Romeo believed, Sbangle by any other name would not shine as bright! To learn more about Sbangle jewelry, housewares and the causes they support visit their website at www.SBANGLE.com.